Domatokeftedes are Greek for tomato fritters. I love using abundant summer produce this way. I may be speaking a little too soon but I can definitely feel summer is slowly winding up. I’m ready for Autumn and it’s delicious treats and coolness however I can’t say goodbye to summer without one last “hurrah”. March is the month of later season tomatoes. They’re perfect in my eyes. Plump, ripe and ready for the kitchen. Last year I featured heirloom tomato and haloumi stacks and this year I have another great tomato recipe to add to your repetoire. 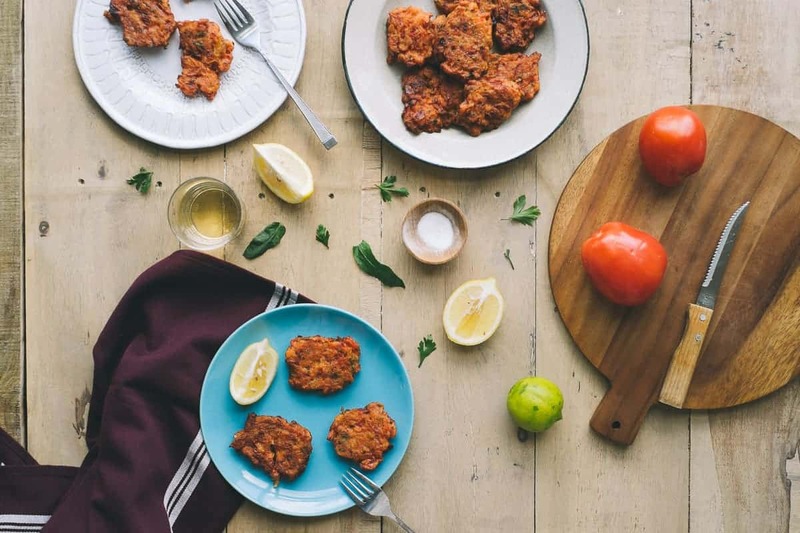 Tomato fritters. Or “domatokeftedes” as they are known in Greek. These little beauties are relatively new to me. They are a specialty from the island of Santorini made with local cherry tomatoes. 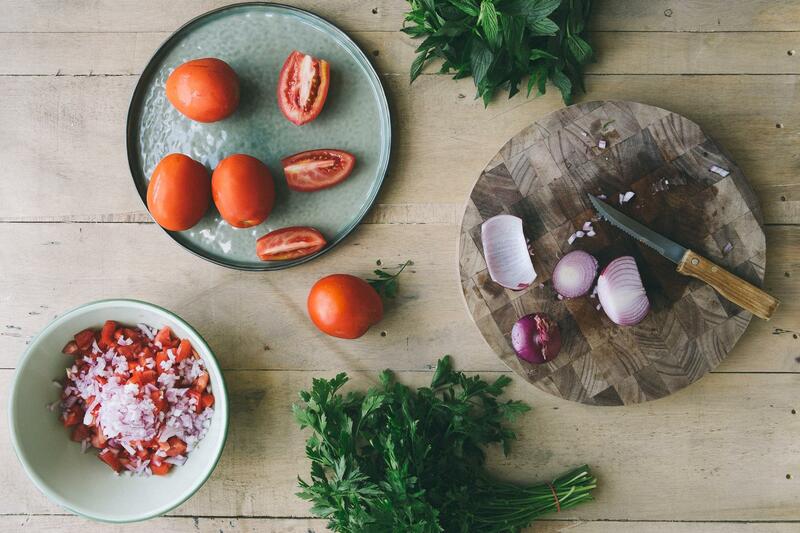 My version uses very ripe Roma tomatoes and I have flavoured them with mint and parsley. I was going to add some dill too, to complete this “Holy Trinity” of herbs but opted not too. The recipe is quite flexible and you could jazz it up with milder herbs such as basil or fresh oregano. I was skeptical these would hold their shape whilst they were frying but they exceeded my expectations. Alas they are not “perfectly shaped”. Let’s just agree to call them “rustic” in appearance. Serve them up with some tzatziki or freshly squeezed lemon. Open up a bottle of crisp Sauvignon blanc and engage in your own Mediterranean Greek island odyssey. Combine the tomatoes, onion, herbs, seasoning, olive oil and flour in a large bowl/ The mixture will be like a very thick pancake batter. Cover and set aside for 30 minutes. Depending on the size of your frying pan heat up enough oil in a pan to shallow fry the fritters. The oil os ready when it reaches 180 deg C on a thermometer. Drop in spoonfuls (using a dessert spoon or soup spoon is fine) of the tomato batter cooking a maximum of 3 fritters at a time. Cook for 2-3 on each side and drain on paper towels. Sprinkle a little extra salt on top and serve with tzatziki or freshly squeezed lemon. I like to use rice bran oil when deep or shallow frying. It’s quite neutral in taste and has a high smoke point.